The 50 and 60 were the first John Deere Tractors to offer farmers a choice of gasoline, “all-fuel”, or liquefied petroleum (LP) gas engine, the latter at a slightly higher cost. LP gas was popular in a few localized areas. Near oil refineries it could be purchased for as little as 5 cents per gallon, making it economical even though a gallon of LP would not produce quite the work output of a gallon of gasoline. LP is a clean-burning fuel, reducing engine deposits. LP must be handeled with pressurized equipment, but some farmers found this a significant advantage over gasoline, which was vulnerable to thieves with siphon tubes. The 60 (and the 70, which joined the line a year later) offered one more option of particular value to producers of tall, bushy, bedded crops like sugarcane, flowers, etc. 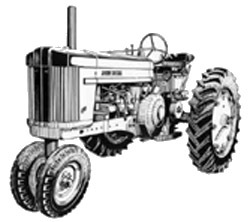 They were available as Hi-Crop tractors with at least 32 inches of clearance under both front and rear axles and a minimum of 48 inches between final drive housings. A special line of John Deere matched working equipment was available for use with these Hi-Crop models. The 50 and 60 also offered a variety of front-end and rear-axle options to fit virtually any row-crop need: Single front wheel, Roll-O-Matic, 38-inch fixed-tread front axle, or front axle adjustable in four steps from 56 to 80 inches. A long rear axle option permitted 62- to 97-inch rear wheel tread. The 60 was originally rated at 27.71 drawbar hp and 35.33 belt hp.